As with many students, going back to school also meant living on a budget for Plett. 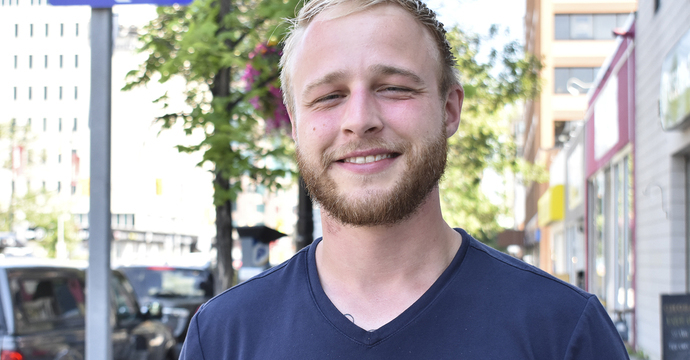 He found an affordable apartment in Winnipeg's North End, and flexible work as a residential care worker at the Tamarack Recovery Centre in West Broadway, serving people working through addictions. These experiences had a profound effect on him. Having grown up in Winnipeg, Plett knew there were neighbourhoods in the city affected by poverty but he had felt pretty insulated from them. "It's heartbreaking when you see people who have no support network, and they don't have a lot of opportunities," says Plett. A colleague at the recovery centre and a Menno Simons College alumna, Kathleen O'meara (CRS '16) told him about Conflict Resolution Studies at MSC, and this summer Plett took Intro to CRS. What he learned is already helping him at work. "I found the concept of nonviolent communication really useful. A lot of people who come through [the centre] have trauma they've been dealing with, and it can be triggered if you're not aware of the language that you're using. Things that seem like insignificant details can be more problematic than you think," he says. "It's all about trying to understand someone's perspective." "In addictions counselling you're dealing with the addiction but you're also dealing with the underlying issues," Plett adds. "Being able to assess those and help to resolve them is key." Most of the careers he had considered in the past were motivated by earning potential, but now he's motivated by something altogether different. "I've had some of those jobs, jobs I did just for the money, and it's not satisfying," says Plett. "If you don't feel like you're doing something that's helping out your community in some way, it doesn't feel like a worthwhile way to spend your time. We've only got so many years." Plett plans to pursue a career in social work or addictions counselling, and says CRS is helping to achieve that goal. In the fall he will return to full-time studies at MSC, and he's looking forward to taking classes like Conflict and Culture, Issues in Indigenous Communities, and Negotiation Theory and Practice. "The courses I'd taken before didn't have that much direction to them, and now I have plan for where I'm going," says Plett.